Éclairs are a classic French pastry made with a simple flour and egg dough called choux (pronounced "shoo"), which is filled with pastry cream and then topped with a simple chocolate glaze. The best way to fill an éclair is with a pastry bag fitted with a special tip called a bismarck tip. It has a long, thin point that will reach the center of the éclair. For frozen éclairs, you can just carefully cut off the tops of the pastries, spoon in vanilla or chocolate ice cream, then replace the tops and hold them in the freezer until it's time to serve them. Then, instead of the chocolate glaze, drizzle them with chocolate syrup and serve. Note: The procedure below assumes you've finished mixing up your choux pastry dough, but you haven't baked it yet. To review, here's the recipe for choux pastry. You're also going to need a batch of pastry cream for the filling. 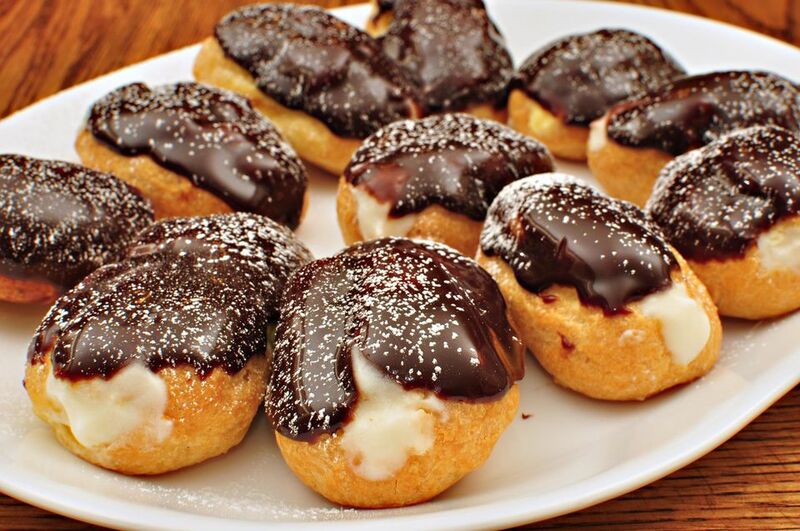 Also, see this Cream Puff Recipe. Carefully dip the top of each éclair into the chocolate glaze. Once the éclairs are all dipped, return them to the fridge to hold until you're ready to serve them.